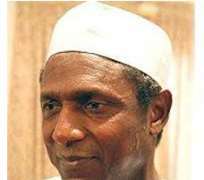 As the controversy surrounding the signing of the 2009 Supplementary Budget by President Umaru Musa Yar'Adua lingers, an organization formed by former head of state, Gen. Mahammdu Buhari, and former Vice-President Atiku Abubakar, the National Democratic Movement (NDM), has faulted the claim. Deputy Senate President Ike Ekweremadu had last Monday said President Yar'Adua had signed the N353.60 billion 2009 supplementary budget into law. The President is currently recuperating from a heart condition at the King Faisal Specialist and Research Centre in Jeddah, Saudi Arabia. However, the NDM has called for the setting up of a 15-man panel to visit the President in his hospital bed to ascertain his health status and obtain a documentary evidence to show that he actually signed the supplementary budget. A statement by the Head of Secretariat of the NDM, Dr. Sule Hamma said: “We call on the Vice-President, the Secretary to the Government of the Federation and members of the Federal Executive Council (FEC) to come out clean with Nigerians and clear the mystery surrounding the nature of the President's medical condition and whereabouts. The membership of the 15-man committee shall consist of a retired Justice of the Supreme Court, two members of FEC, the President's personal doctor and two other highly respected doctors and independent medical practitioners. Other members of the committee, it said, shall comprise majority and minority members of parties in the National Assembly and a representative each from the Nigeria Bar Association (NBA), Nigeria Labour Congress (NLC), Nigerian Union of Journalists (NUJ), Nigeria Medical Association (NMA) and National Council of Women Societies (NCWS). The statement said at the end of the visit, the committee shall submit a report to the Vice-President. The Vice-President shall in turn table same as a memorandum for consideration to the FEC, which resolution shall be made known to Nigerians within 24 hours. In the same vein, a group, Concerned Nigerians, has decried the refusal of the President to hand over the leadership of the country to Vice-President Goodluck Jonathan when leaving the country on 23 November, 2009 for medical reasons.